A thick, rounded, underground storage organ consisting of layered, fleshy leaves and membranes. 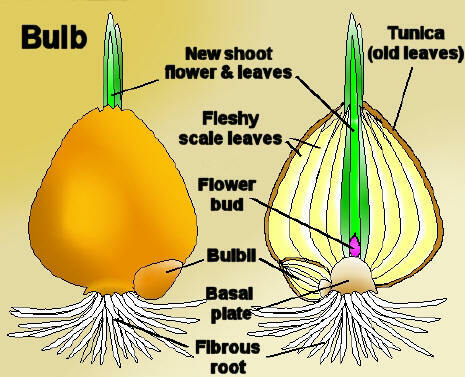 A bulb is an underground stem, usually globular, containing a complete embryonic plant inside, with tiny flowers, stems, leaves, and roots. The contents of the bulb are often enclosed in protective, fleshy scales emerging from the top which are held together by a small basal plate. The scales are modified leaves that contain enough nutrients to sustain the plant through dormancy and early growth. The fleshy leaves are storage organ that store food and water, they may be loose and open. In many bulbs, a paper-thin tunic protects the scales. Fibrous roots emerging from the bulb's basal plate. Examples include the tulip, narcissus, and onion. There are two main types of bulbs. One type has a thin paper-like covering that protects its fleshy leaves (for example, the onion). The second type, called a scaly bulb, does not have a papery covering and looks as though it is composed of a group of angular scales (for example, the true lily).